Embark on an adventure out of this world, with custom tailored rewards and bonuses. Weekends are good for spinning! 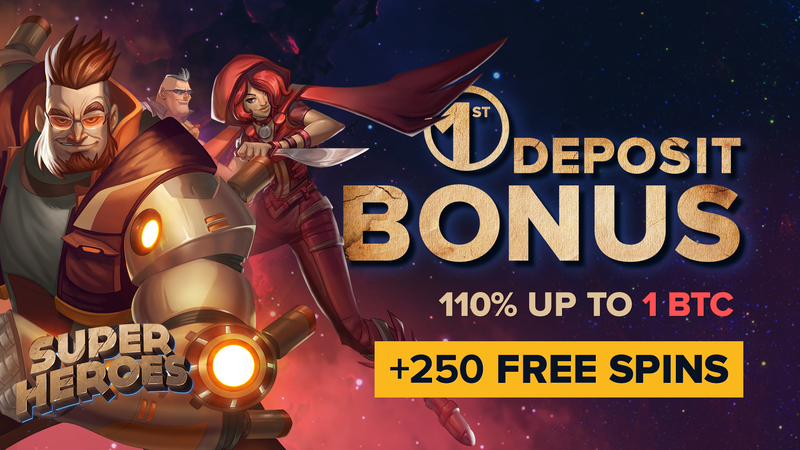 Get up to 100 HR Free Spins on every deposit made this weekend. 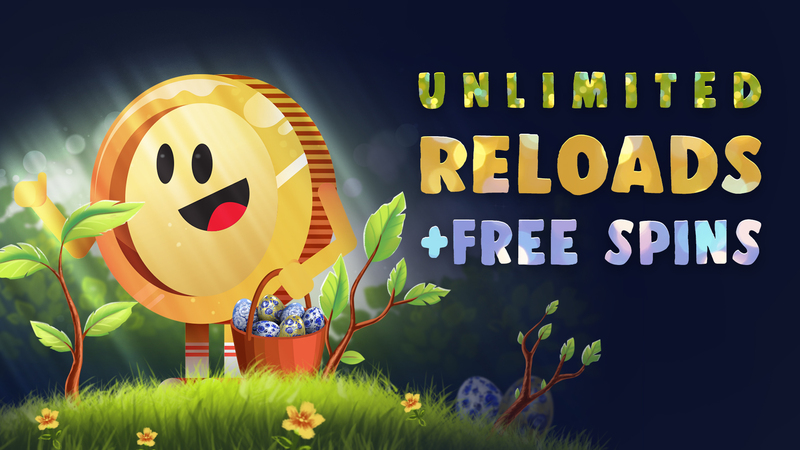 Easter Magic is unfolding at mBitcasino! You don’t have to wait to enjoy a lucky-streak. We want you to fully experience the luck of the Irish, so we’re supplying you with unlimited sets of free spins. You won't believe how generous the Easter bunny is at mBitcasino! There are plenty of Easter eggs ready to be opened. So, if you want to win big and skyrocket your bankroll, this is the place to be! We love weekends as much as you do, so get up to 100% twice, every Friday (up to 200 mBTC / 200 mBCH / 200 mETH / 2 LTC / 100,000 DOGE / 300 EUR) and kick off the weekend in style. Sign up, verify your phone number, and get 50 free spins to start spinning right away. 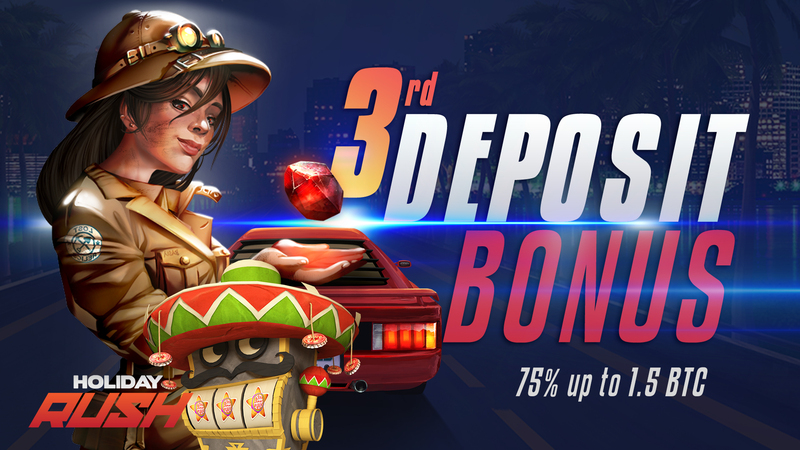 Make your first deposit today and start playing with an extra 110%! That means you receive up to 1 BTC / 23.05 BCH / 35.7 ETH / 124 LTC / 1,982,000 DOGE / 3,800 EUR on the house! Already made your first deposit and want to get back in the action? Receive 50% up to 2.5 BTC / 57.6 BCH / 89.4 ETH / 310.5 LTC / 4,950,000 DOGE / 9450 EUR on top of your second deposit! Receive a 75% bonus up to 1.5 BTC / 34.6 BCH / 53.7 ETH / 186.5 LTC / 2,975,000 DOGE / 5,700 EUR on your third deposit. Monday blues? Not on our watch! 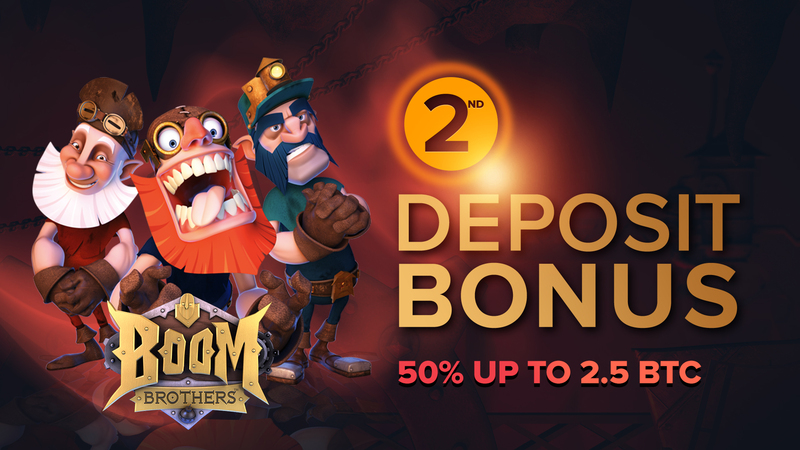 Power up your Monday with a 50% bonus (up to 200 mBTC / 200 mBCH / 200 mETH / 2 LTC / 100,000 DOGE / 300 EUR) on top of your deposit, and boost your chances of winning. Receive up to 20% cashback on your losses, up to 100 mBTC, 500 mBCH, 500 mETH, 5 LTC, 200,000 DOGE or 500.00 EUR, every day! 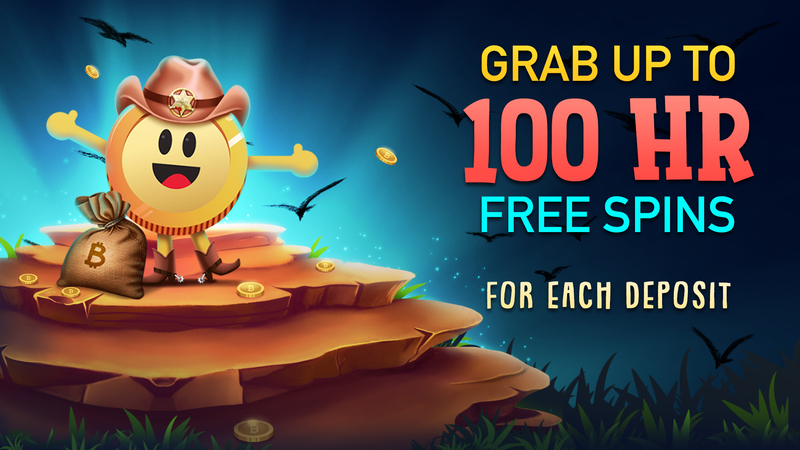 Welcome to mBit promotions where we are giving away 5 BTC plus 300 free spins as part of our unique 3-part welcome bonus for new members and showcase our exclusive weekly bonuses available to all current members. Don’t worry, because our bonuses also apply to BCH, ETH, LTC, DOGE, and Euro currencies. Simply make a deposit in your chosen currency, we’ll credit your account and add your bonus amount on top, so you are ready to kickstart your casino experience on any one of our table games, slots, video poker or jackpot games. 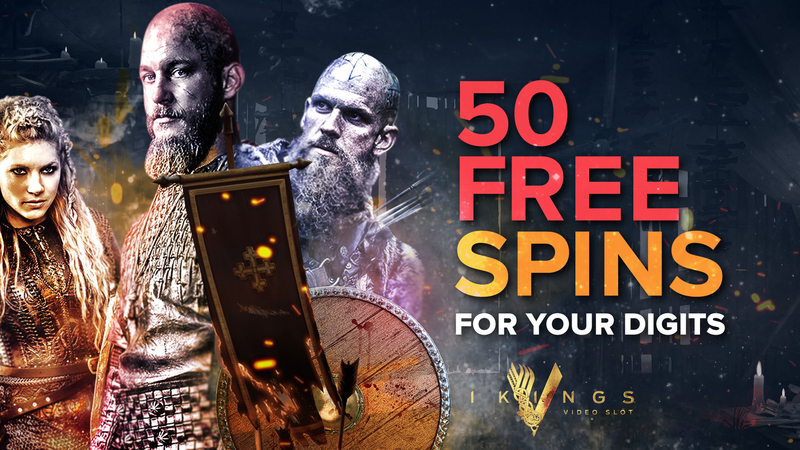 Simply sign up with your telephone number, and your account will be loaded up with yet another 50 spins to take to our wide selection of slots, which include top titles from BetSoft, Bgaming, Endorphina, Play ‘n’ Go, Quickfire and other top developers. It doesn’t matter if you are a new or an existing member, once you have signed up to mBit Casino the bonuses just keep on coming. Just check out our lucrative selection of weekly bonus promotions here on this page. You will find an array of exciting opportunities to top up your bankroll with free currency throughout the week. Effectively we want to give you the chance to beat the house with free bonus cash. What you do with your bonus is entirely up to you. Whether you want to bet it all on red or black playing roulette, double your stakes on the blackjack tables or play some of our LIVE dealer tables from Evolution Gaming, the choice is up to you. Maybe you can try your luck on one of our jackpot games where your bonus cash could potentially see you walk away as a newborn millionaire. Mega Moolah from Quickfire is just one of the many progressive slots we have that has paid out over $1,000,000 worth of currency in a single spin on several occasions. It’s your bonus to do what you want! 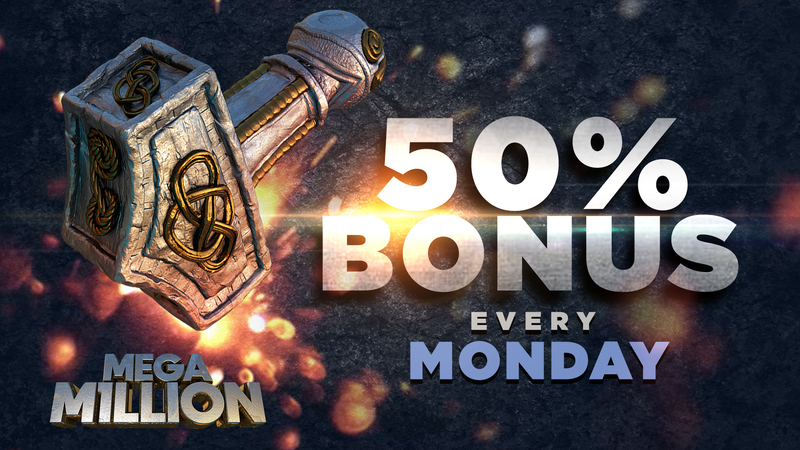 Powerup your bankroll with an up to 50% bonus to brighten up your Monday or kickstart your pre-weekend with yet another up to 50% bonus paid on top of your deposit. What better way is there to reduce the house odds and increase your RTP per bet when a large chunk of your action is covered by our daily cash back bonus promo? It’s easy to become a VIP member at mBit because as soon as you sign up you become a planet earth member, which gives you 2% cashback on your losses and a 20% weekly reload bonus. Skyrocket your VIP status from Planet Earth to The Moon. Each time you place a bet, you will earn VIP loyalty points (VLPs). There are 7 more tiers to climb above Planet Earth with each tier unlocking bigger and better bonus rewards for you. 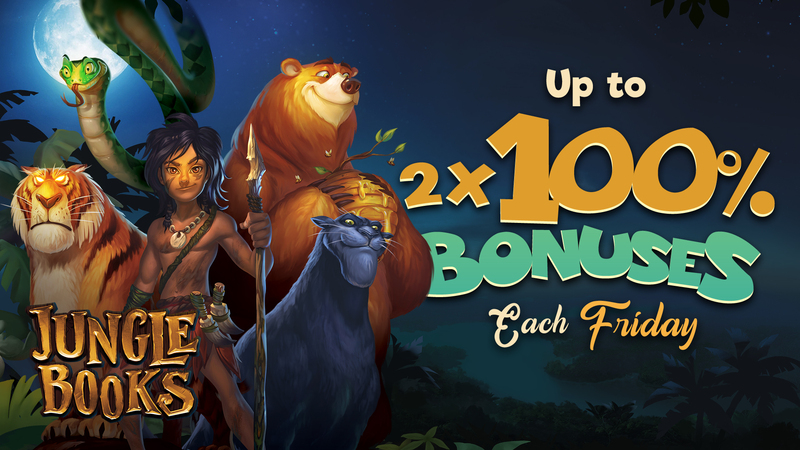 Plus, each time you reach a new milestone, we’ll reward you with free spins with no deposit required. Why settle for VIP bonuses that send you rewards that can only be played on games you don’t particularly like? At mBit Casino we go out of our way to roll out the red carpet by giving our loyal VIP members bonuses and rewards customized to their personal gaming preferences. That means if you become a VIP and you like slots, then we’ll make sure you get more spins on the reels or the chance to increase your stakes per spin. Blackjack players will see more hands, and roulette players more coups. In short, we make sure your VIP bonuses count by making sure you receive a bonus that enhances mBit experience. Check out the terms and conditions on all our bonuses. 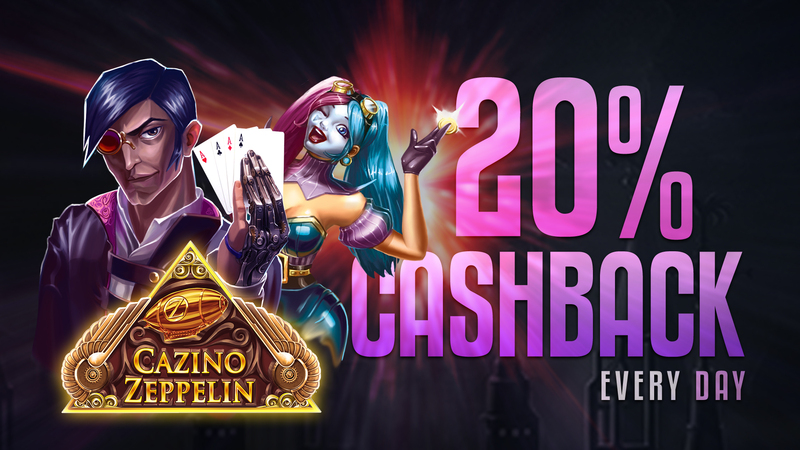 We play fairly and make sure that you get the best deal from one of the world’s best online casinos!